Hmmmm...... 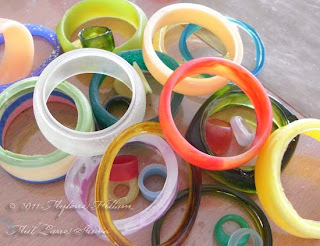 It seems I have one or two resin bangles and rings to finish! Now that I have a Dremel in my studio, you might be thinking that sanding resin would be an absolute breeze. And it would be if resin didn't produce such fine dust - dust that is not at all good for your lungs. So that means lots and lots of hand sanding..... with wet and dry sandpaper...... and a good dose of elbow grease! It's a good thing that I find this process very therapeutic or with so many pieces to finish, it would be a real chore. So despite the temptation to try out the Dremel on resin, I will be hand finishing all of these pieces. Now let's see how many I get through today.